The advantage of being a pensioner is that you are not bound by school holidays when you want to go on holiday. Another advantage is that if you travel outside of the normal tourism high season, accommodation is fairly easy to come by. M y husband and I are from South Africa and like to explore our neighbouring countries. Because we enjoy our own company, we often travel completely alone. We also try to avoid the maddening crowds and big cities. Part of the joy of travelling in Namibia, is that we often spend many kilometers, hours and sometimes days without seeing a single soul. It also gives us time to explore the off-the-beaten-track areas unhindered. We are quite sure that by doing so, many people think we have lost our marbles. To us, travelling alone is part of the travel adventure but at the same time, we remain cautious of the fact that we cannot afford to take unnecessary chances just for the sake of adventure and therefore, if needed, we will adjust our travel plans to ensure that we do not become a burden to others. We planned on spending our trip exploring Damaraland and Kaokoland, our favourite parts of Namibia. These parts are very mountainous and to the untrained eye barren. It is home to the Ovahimba, an indigenous tribe known for their traditional clothing, hairstyles and bodies covered in a buttery red ochre cream. The Himbas are also considered to be the last nomadic people of Namibia. 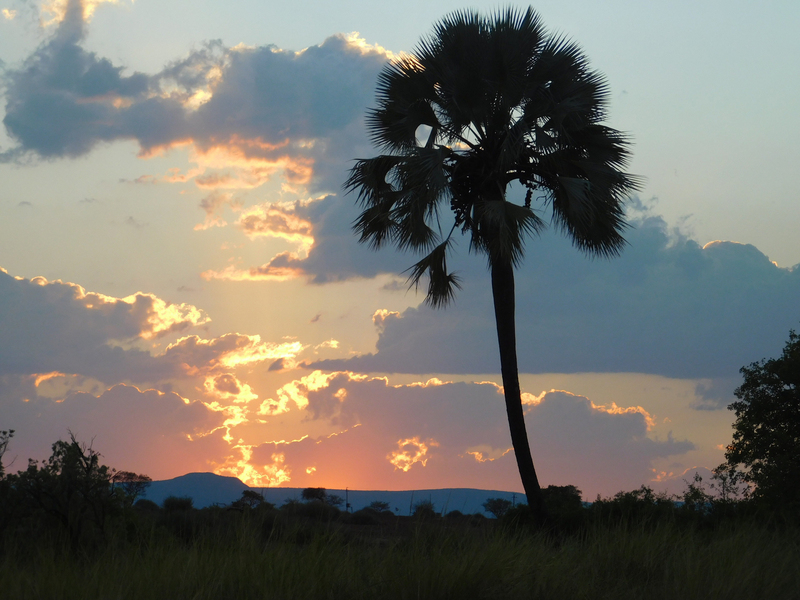 The arid areas in Namibia are far from being “dead” and are a treasure trove when it comes to fauna and flora. The abundance of plants adapted to arid conditions, especially in the north, can easily fool people to think that the countryside is green. It is green, but not the type of green that comes with a lot of rain. Plants encountered here are the Damara Euphorbia (Euphorbia damarana), the bottle tree (Pachypodium lealii), the Kaoko Sesame-bush (Sesamothamnus benguellesis) and of course the Welwitschia (Welwitschia mirabilis). 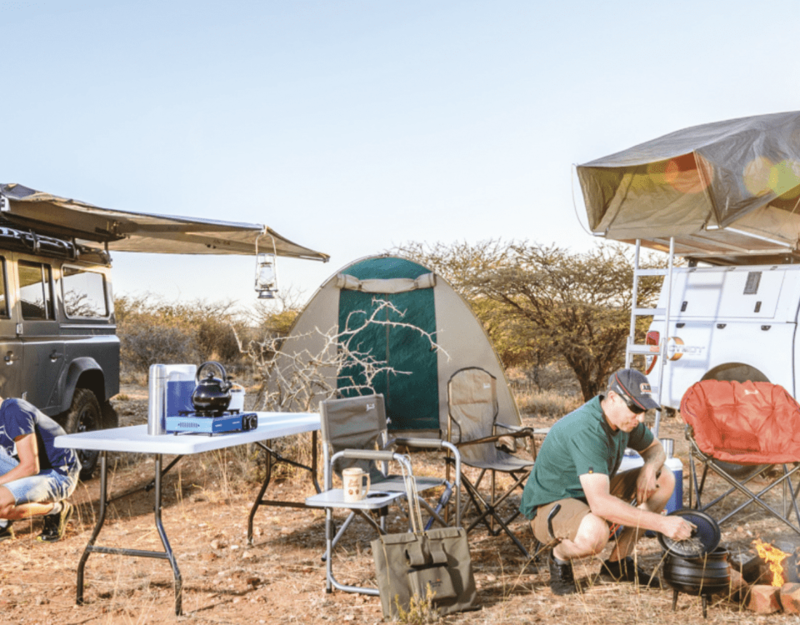 The absence of modern developments and the richness of biodiversity prevalent in the desert parts of Namibia are just some of the reasons why we like to spend our time exploring the desolate parts of Namibia. 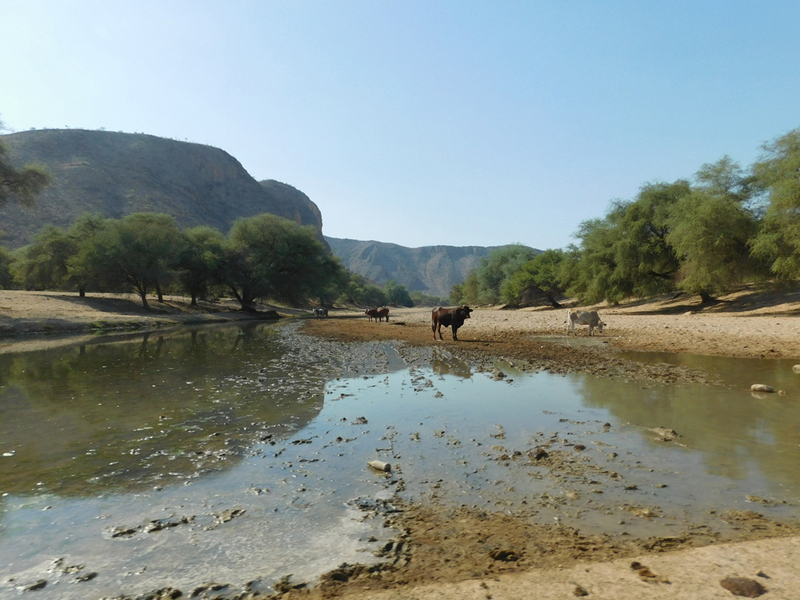 We spent nights and days planning our most recent trip and marveled at the idea of seeing the famed desert elephants and other animals endemic to the arid areas. Despite all of our planning, we found that we had allocated too little time for all that we wanted to do and see. The most beautiful sunsets can be seen in Kaokoland. The trip was to last about six weeks. We realized that extensive tours always come at quite a cost and therefore we consciously tracked down affordable and not always well-known accommodation with the idea to share this information with others wishing to follow in our tracks. We entered Namibia through the Mata Mata Gate of the Kgalagadi, and less than a half kilometer after leaving South African territory, we had our first “forced” stop at the Sitzas Farm Stall. Many travel journalists have referred to this farm stall, but what has not been mentioned is that it sells possibly southern Africa’s best lamb chops and Springbok droëwors. We traveled through the southwestern part of Namibia, via Mariental and Solitaire, all the way to Swakopmund where we had to stock-up with food and drinks for the long haul through Damara- and Kaokoland. After doing the “tourist” thing in this beautiful coastal town, we took the salt road towards Henties Bay and onwards to the entrance of the Skeleton Coast Park at the mouth of the Ugab River. The first couple of kilometers on the salt road was fascinating and nerve wrecking at the same time. The fog was so dense that we could hardly see oncoming traffic and often had to reduce our speed to less than a snail’s pace. Most travelers will associate the Skeleton Coast Park with shipwrecks (of which some can be seen from the road). Don’t forget that it is also one of the few places in Namibia where the ancient Welwitschia mirabilis plant occurs and where it is possible to view the plant without leaving the road. While taking photos of the ancient plants, we once again realized how fascinating, fantastic and above all, fragile, this part of the world is. It was with much sadness that we saw the imprints of tyres, of vehicles that went off-road to drive to the plants. Despite off-road driving being prohibited in these areas due to the sensitive ecology and the fact that these tracks remain there for many years, many people still act carelessly. Inland, on our way to Kamanjab, we consulted some locals on the availability of camping accommodation in the area. They directed us to the Camel Top Campsite. We were wonderfully surprised with what we found. 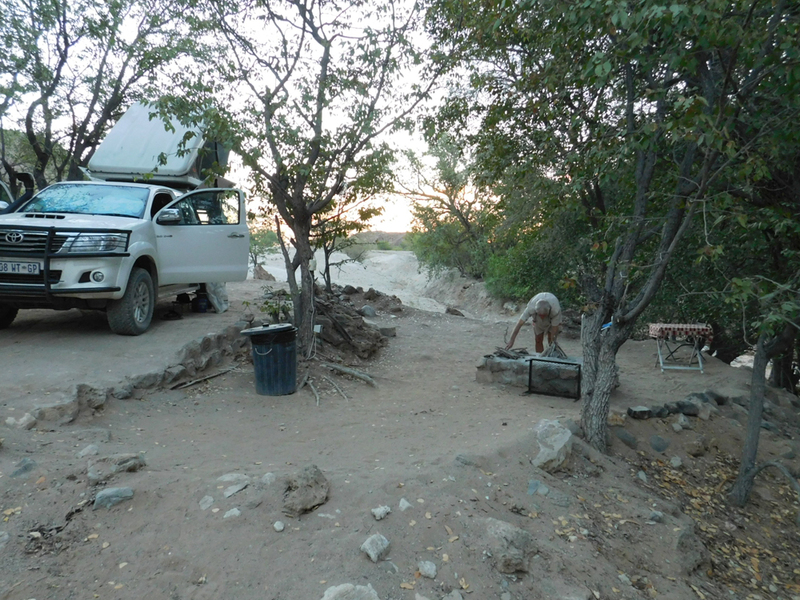 Camel Top Campsite is possibly the best kept accommodation secret in remote Kaokoland. The camp consist of 6 sites, all with electricity, a fire place and water which comes directly from one of the many springs on the farm (and from where the name Sesfontein was derived). In addition to this, each stand has its own shower with water heated in a donkey (a geyser heated with fire) and a flushing toilet. The cost per person is N$80 and an additional N$40 for a big bundle of wood. Camel Top made it onto our list of campsites which we can recommend to all who enjoy small, out of the way camps that are clean, quiet and VERY affordable. 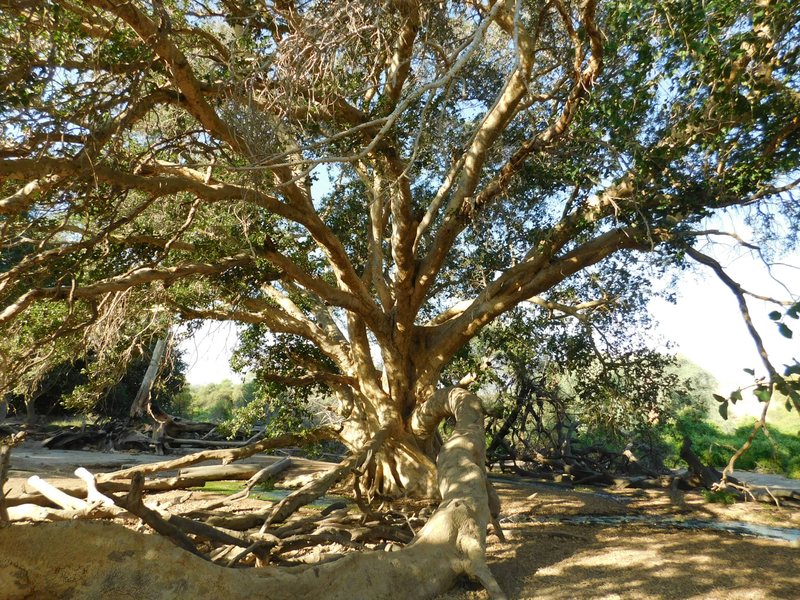 Beautiful trees grow at Camel Top Campsite. Camel Top Campsite outside of Sesfontein. A view towards Purros from the campsite. Our tour took place during the off-season and we made no reservations for accommodation anywhere. It was therefore a wonderful surprise to be welcomed by the staff at the Khowarib Schlucht lodge. We were shown the campsite and were informed that all the facilities, including Wi-Fi and the pool, were available to all guests as well as those camping. The campsites are about 300 meters away from the lodge, with a number of the sites facing the Hoanib River in the Schlucht, which means that you get the full repertoire of the local frog choir at night. Fantastic! The staff and the lodge come highly recommended – we later learned that the staff is mostly graduates from a hospitality school in Sesfontein. Our intention was to travel through the Khowarib Schlucht on the famed 4×4 track that links with the C35 but we were informed that it was not advisable for only one vehicle to travel this road alone. Apart from long stretches of deep sand, the route is also known for its “dust holes” that occur without any real warning. These stretches of track are filled with the finest talcum-like dust that billows around the car into every crevice – a sure guarantee to mess up any vehicle’s air filter. We weren’t fully convinced that the road was as bad as indicated by the locals and embarked on a recce on foot one afternoon. After about 7 kilometers of exploration we returned to the lodge a few hours later. The advice was sound, so we decided to change our travel plans. We drove back in the direction of Palmwag to get to Kamanjab. Approaching the veterinary disease control point, or “red” line, as we drove past Palmwag, we could see a long line of vehicles waiting to be cleared. All vehicles travelling from north to south are checked as part of the foot and mouth preventative measures undertaken by the Namibian authorities. 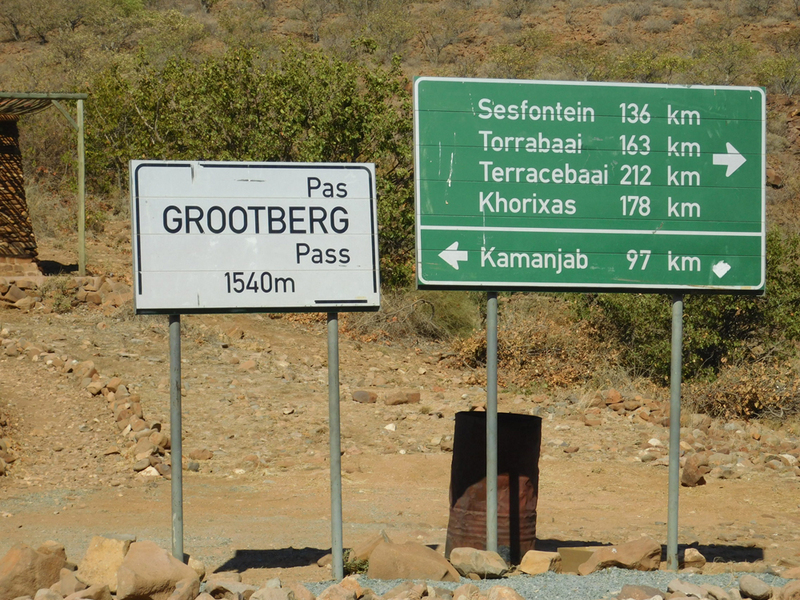 Once cleared, we were on our way to Kamanjab via the Grootberg Pass. Travelling up the Grootberg Pass, which is 1540 meters above sea level, was a great new experience and another of our recommendations. To the west, when standing at the highest point, you have a wonderful view of the whole landscape towards the Skeleton Coast and towards the east; it felt as if you could see tomorrow coming! As we descended the pass in the direction of Kamanjab, one of the desert elephants rewarded us with a view of his back while disappearing in the distance. Our campsite at Khowarib Schlucht Lodge. Once we had replenished our food stock in Kamanjab, our next destination was Alpec Bushcamp and Gamepark. Again, arriving without any reservation meant that we were taking a chance. Luck was once again on our side and it turned out that we were the only people in the Bushcamp. 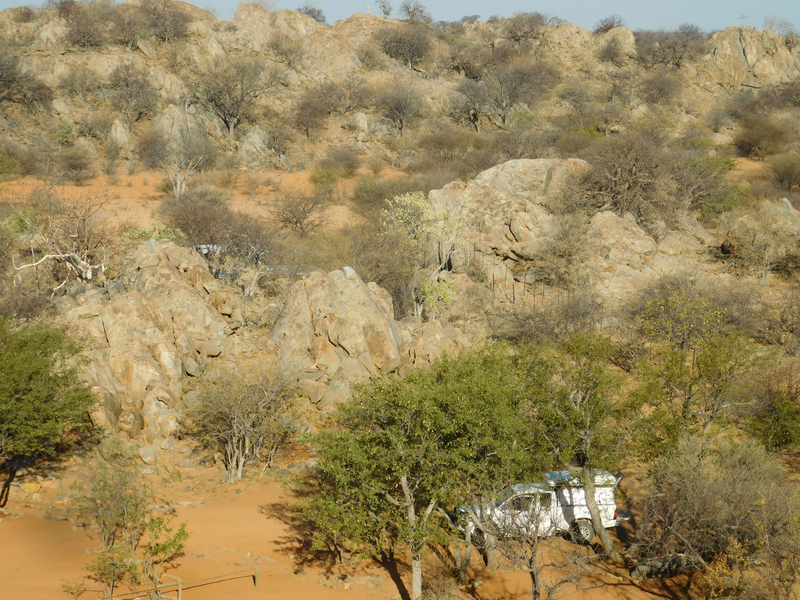 It is a cosy camp that seems to cater mainly for big game hunters, but camping tourists are always welcome. The camp has a small pub and restaurant, should you not be in the mood to make your own meals. 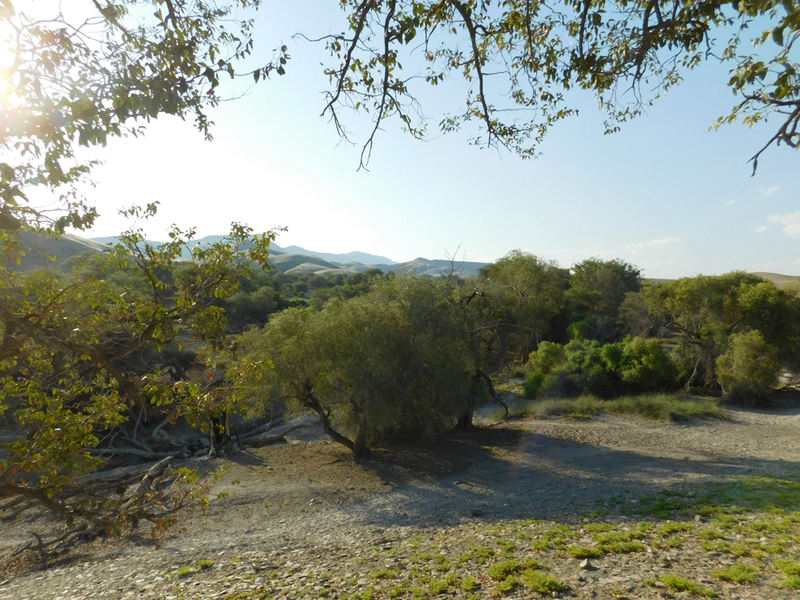 At night a small waterhole and feeding area is lit up so that guests can view wildlife. A stop at Alpec comes highly recommended. We made time for a quick stopover at Etosha National Park. We entered the park through the Galton Gate on the western side of Etosha (only 70km from Alpec Bushcamp). The trip through the park was fantastic and well worth the money paid for the day pass. We stopped at the newly built Olifantsrus camp and were pleasantly surprised to see how nice the waterhole and access to it was designed. A wooden ramp takes visitors to a tower from where the animals coming for a drink can be viewed. Due to the poor state of the first 70km of the roughly 170 km between the Galton and Anderson gates, we were forced to travel a lot slower than the speed limit. This however, allowed us to enjoy not only the game sightings but also the ever-changing environment. Our day pass allowed us to exit the park through the Anderson Gate, which is close to the Okaukuejo rest camp. Once outside the park we made our way to the Mopane Village Lodge where two big decorative eagles sitting on the gate posts invite visitors. The lodge has chalets for those who want to sleep in a bed and for those who prefer to pitch their own tent the individual campsites all have a power point, private shower and toilet. 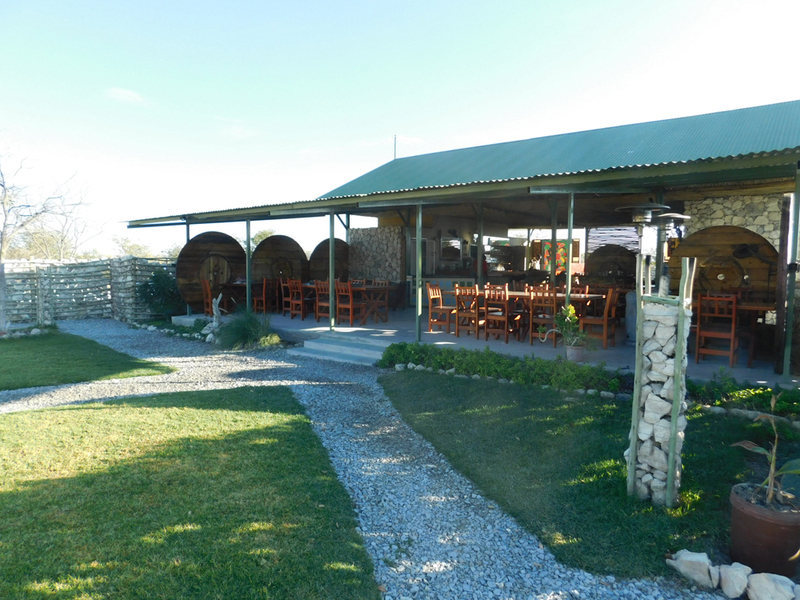 At N$90 per person, Mopane Village Lodge is a very good option for those who wish to visit Etosha on a day pass as it is only about 14km from the Anderson Gate. 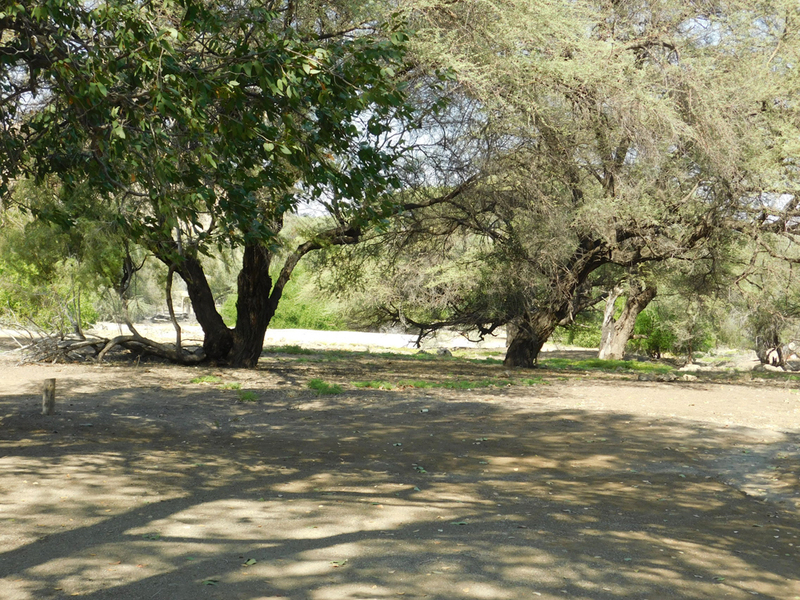 Alpec Bushcamp outside of Kamanjab. Reaching the top of the Grootberg Pass.